4 Carat Oval Three Stone Engagement Ring. 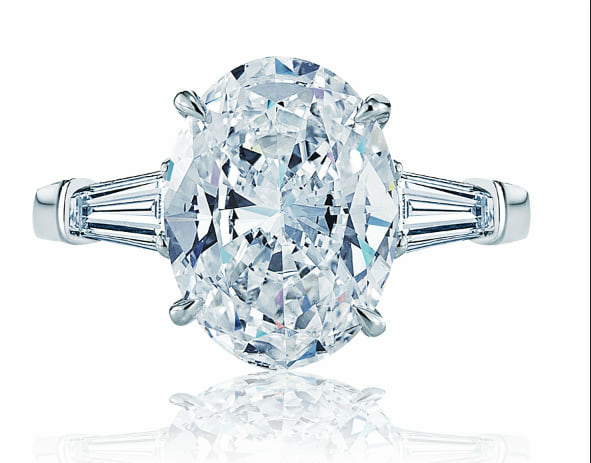 This gorgeous 4 carat oval diamond has a brilliance that has to be seen in person. The center oval diamond weighing just over 4 carats and having a white G color and SI clarity its nothing short of amazing. The center is flanked by two perfectly complimenting tapered baguette diamonds which also have a color G and a clarity of VS. The mounting is forged out of platinum and done by hand to give the diamonds a deserving showcase to show their brilliance and beauty. Providing large and rare diamonds just like this one is a priority of Winston’s Crown Jewelers and its what sets us apart from other jewelers and jewelry stores in Orange County. We acquire the rarest and largest of diamonds found in Orange County and have the largest diamond selection in Southern California .This ring and many like it are crafted and designed in our Newport Beach location, west of Costa Mesa and north or Laguna Beach and Corona Del Mar.